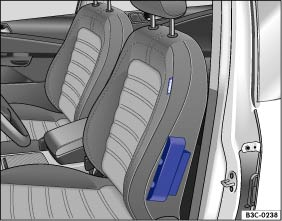 The side airbags are located in the outer seat backrest cushions of the driver seat and front passenger seat . The locations of the airbags are marked with stickers with the word AIRBAG. 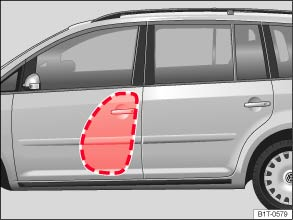 The area marked in red indicates the side airbag deployment zone. During a side collision, the side airbags will be deployed on the vehicle's side of impact, reducing the risk of injury to the areas of the occupants' bodies facing the impact. The airbag deploys in fractions of a second and at high speed. Always leave the deployment zones of the side airbags clear. No other persons, animals or objects may be located between the occupants of the front seats and the airbag deployment zone. The built-in coat hooks should be used only for lightweight clothing. Do not leave any heavy or sharp objects in the pockets. Do not fit any accessories onto the doors. Do not fit seat covers or protective covers over the seats unless they have been expressly approved for use in the vehicle. Otherwise the side airbag may not be able to deploy if it has been triggered. Incorrect use of the driver and front passenger seat could hinder the proper function of the side airbag and cause serious injury. Never remove the front seats from the vehicle or alter any components of these seats. If too much pressure is applied to the backrest side bolster, the side airbags may not be triggered correctly, or may not trigger at all or trigger unexpectedly. Any damage to the original seat upholstery or around the seams of the side airbag units must be repaired immediately by a qualified workshop.